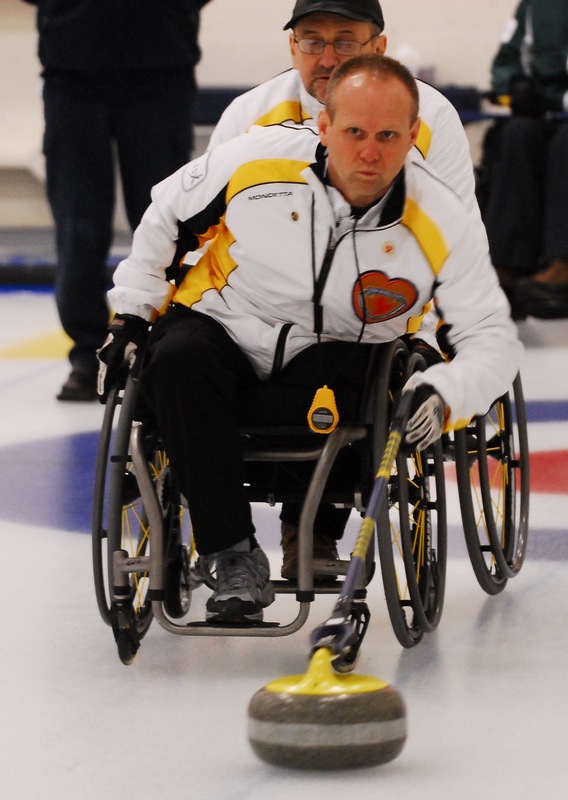 It was no secret to anyone watching the 2010 Nationals in Kelowna last March that Chris Sobkowicz's Team Manitoba were an unhappy group. So it came as no surprise to learn at the beginning of this season that long time teammates Chris Sobkowicz and Dennis Thiessen had decided to form their own teams and compete against each other for the right to represent Manitoba at the 2011 Nationals in Edmonton AB. Thiessen's teammates, Effie Loubardias, Michael Alberg and Heather Mowat who travelled over 500kms for each team practice, raised funds to participate in spiels in Calgary and Ottawa, knowing and agreeing that this season would likely be a development year. At the end of November, Dennis told them "I don't feel we as a team are ready for it yet," and that he would be playing with Chris Sobkowicz after all. The lateness of his announcement meant there was no time for the remaining players to find a replacement, and Team Sobkowicz was declared Manitoba's provincial team by default. Nothing wrong with wanting to win, but at what cost in broken promises? The hurt feelings that will be the legacy of preparations for the 2011 campaign are not likely to help development of the sport in Manitoba. So, what is the team, now? How on earth do you know if there are "hurt feelings"?> If this were a truly competitive sport, beyond international. repacing players is a part of the game. Come on, Eric, if this is competitive, this is a no news situation, ESPECIALLY in Manitoba. Maybe, as you see it, a bunch of friends in a club league split up, there are more "hurt feelings".....is this competitive or not? If Manitoba does not have a playoff for the provincial championship thats a shame. Hard to believe that such a curling province cannot provide enough teams for a play-down. The sport needs to grow and have all provinces have a true championship not just a picked All Star team. The competitive level may not be the same but the growth of competitive players would grow.i suspect the sport will suffer in Manitoba because of this decision. Yes they may get another Bronze medal but at what cost ? Dissension in the ranks will never lead to a winner. I think the issue is that Thiessen dumped his whole team rather than just replacing one player. I believe Team Manitoba has one change from last year: Melissa Jasper replaces Arlene Ursel at lead. Chris Sobkowicz, Dennis Thiessen, George Horning, Melissa Jasper, Terry Lindell. Wonder how Arlene feels? Bob Ursel is out in B.C., due to injury.......as well???? I don't think Arlene intended to compete this year. Bob Ursel is out with a injured knee. When Chris Sobkowicz wrote to me at the end of September, there was no mention of Dennis playing on his team. Chris said he expected a contest for the Manitoba provincial title. Dennis asked Effie Loubardias, Michael Alberg and Heather Mowat to play with him, accepted the use of funds they raised to play in Ottawa and Calgary, and then decided to leave them and return to Team Sobkowicz. Nothing in the rules to say he can't do that, and it's true that teams form and reform all the time in regular curling. What has caused hard feelings is the timing, and the breaking not of a legal commitment, but, in my opinion, a moral one. I really enjoy your site, although \i only check in every two or three weeks, but I would like to know more about Team Canada....what is new? C'MON I HAVE BEEN READING THIS OVER & OVER. I FEEL IT WAS MEANT FROM THE BEGINNING WHAT THESE TWO DID. THEY WANTED TO SPLIT THE TEAMS SO THEN WHEN THE #%$* HITS THE FAN THEY CAN TAKE ALL THE GOOD PLAYERS AND CREATING HAVOC AMONGST THEM. WHO IS DENNIS THIESSEN. HOW DID HE DECIDE THAT THE TEAM WASN'T READY! DOES HE HAVE COACHING STATUS OR ANY STATUS THAT GIVES HIM THE RIGHT TO DO THAT. THAT IS JUST TYPICAL, JUST LOOK HOW THEY ACTED LAST YEAR. AND WHERE IS THAT TEAM NOW? MOST OF THEM SPLIT. WHAT DOES THAT TELL YOU. Have not heard from there All Star lead of how many years in a row. Can it be true she quit team Manitoba ? What does she know that the MCC needs to know. Stop the Bullies . Let the province grow. I don't see there's any bullying here - some bad faith, perhaps, or buyer's remorse. Nothing that wouldn't be solved by having more people playing. I don't think certain members of team manitoba want that kind of information made public.